The DC voltage test and detection sensor module wbv121s07 chip PLC DSP AD sampling is a single or double circuit current or voltage signal which will input single channel DC voltage signal to output isolation, and improve the electrical isolation performance between input, output and power supply. The signal isolator uses advanced digital technology, which has excellent performance in the suppression of high and low frequency interference signals. Even in the high power frequency control system, it can be used reliably. The internal use of digital adjustment, zero and full potentiometers, automatic dynamic calibration zero, automatic temperature drift compensation Many advanced technologies, such as the application of this series of technologies, ensure the stability and reliability of products. The above technologies are ahead of the international advanced level. The PLC DSP AD sampling of the DC voltage test and detection sensor module wbv121s07 chip can be used with the unit combination instrument and DCS, PLC, DCS, MCu, MCU acquisition card and so on. It is widely used in the major projects in the fields of oil field, petrochemical, manufacturing, electric, metallurgy and so on. 1. Protect the control loop of the lower level. Two, weaken the influence of environmental noise on the test circuit. First of all, the three elements of interference are interference source, sensitive source and coupling path. These three elements are missing, and the problem of electromagnetic compatibility will not exist. Therefore, we should start with these three elements. Find the most convenient solution, the general interference source and sensitive source can not be solved, usually from the coupling path to think of ways, is also the most commonly used method. Such as adding shielding, adding filtering and other means. The circulation is the most common and the most troublesome problem. (1) the first method: all field devices are not grounded, so that all process loops have only one grounding point and no loop can be formed. This method seems simple. But it is often difficult to implement in practical applications, because some equipment requires ground to be grounded to ensure measurement accuracy or personal safety. Some equipment may be formed for a long time because of corrosion and wear or climate impact. (2) second methods: the electric potential of the two place is the same (as shown in Figure 1, to make V1=V2), but because the grounding resistance is influenced by many factors such as geological conditions and climate change, this method can not be completely done in practice. (3) third methods: using the signal isolator in each process link, disconnecting the process loop, and without affecting the normal transmission of the process signal, so that the problem of the ground loop is solved thoroughly. In most cases, the use of signal isolator + non isolation card is cheaper than using isolation card. The signal isolator is superior to the isolating card in its isolation capability and electromagnetic interference resistance. The signal isolator is flexible in application, and it also has the functions of signal conversion, signal distribution and interface conversion, and it is more convenient to use. 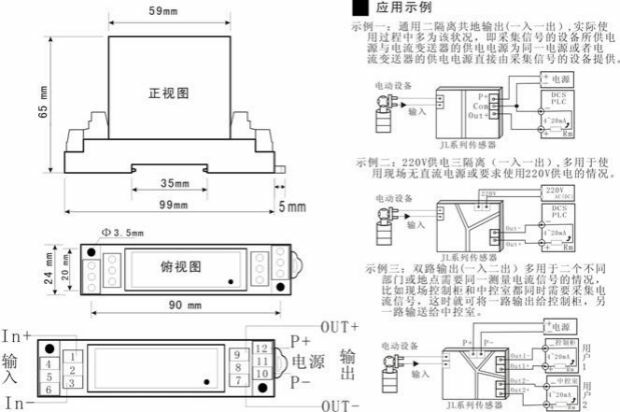 1 pay attention to the auxiliary power information on the product label, the auxiliary power supply grade and polarity of the transmitter can not be mistakenly connected, otherwise the transmitter will be damaged. 2 forward direction output can be obtained when the current direction is aligned with the arrowhead on the product shell. 3 the temperature of the original bus bar should not exceed 60 degrees. 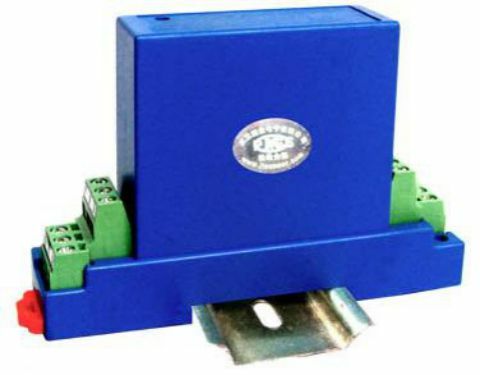 When the current bus bar fills the original threading hole, the best measurement accuracy can be obtained. 4 the lightning protection circuit is not set inside the transmitter, and lightning protection measures should be taken when the input and output feeder of the transmitter is exposed to the outdoor climate. 5 the transmitter is an integrated structure, which can not be dismantled while avoiding collision and falling. 6 do not damage or modify the label or logo of the product, do not disassemble or refit the transmitter, otherwise the company will no longer provide "three packages" (replacement, package, Bao Xiu) service to the product. 7 the current sensor must select different specifications according to the rated effective value of the measured current. The overcurrent of the measured current will damage the terminal power amplifier (magnetic compensation). Under normal circumstances, the overload current of 2 times can not exceed 1 minutes. The 8 voltage sensor must be described in the original side with a current limiting resistor R1 to make the original edge rated current. In general, the duration of the 2 times overvoltage must not exceed 1 minutes. 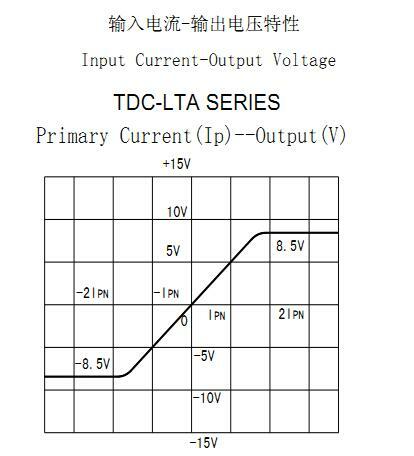 The best precision of the 9 current voltage sensor is obtained under the original side rating, so when the measured current is higher than the rated value of the current sensor, the corresponding large sensor should be selected. When the measured voltage is higher than the rated value of the voltage sensor, the current limiting resistance should be readjusted. When the measured current is below the rated value of 1/2, in order to get the best accuracy, a multi circle number method can be used. 10 the 3KV with insulation voltage can work normally in the 1KV and below AC system and 1.5KV and below DC system for a long time. Be careful not to use overpressure. 11 when using a device that requires good dynamic characteristics, it is best to use a single copper and aluminum busbar and fit the aperture with a large generation of small or more ring cycles, all of which will affect the dynamic characteristics. 12 when used in a large current DC system, it is worth noticing that the core will generate larger remanence due to some reason causing the work power to open or malfunction. The remanence affects the accuracy. The demagnetization method is to exchange power on the primary side without increasing the power supply and gradually reduce its value. The 13 sensor\'s ability to resist external magnetic field is a current of 2 times the original current value of the distance sensor 5 to 10cm, which is more than the original side current of the sensor, and the magnetic field interference can be resisted. When three-phase large current cabling, the interphase distance should be greater than 5 ~ 10cm. 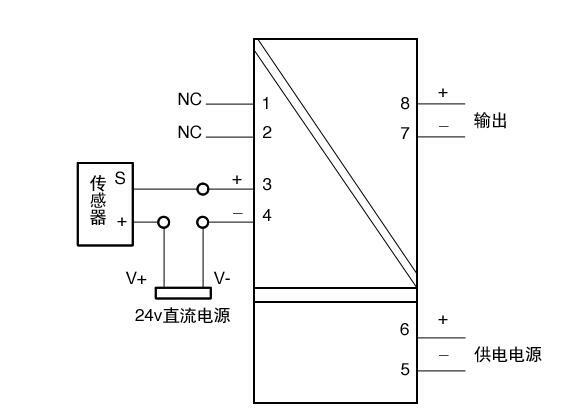 14 in order to make the sensor work in the best state of measurement, we should use the simple and typical regulated power supply introduced in Figure 1-10. The magnetic saturation point and circuit saturation point of the 15 sensor have a strong overload capacity, but the overload capacity is time limited. When the test overload capacity is tested, the overload current of more than 2 times is not more than 1 minutes. 17 the insulation resistance of signal isolation is better, and the withstand voltage should be >2kV. 18 the output load of PT and CT is small, because the core section of PT and CT used by transmitter is restricted by volume.